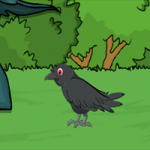 G2J Crow Rescue From House is another point & click escape game developed by Games2Jolly. In this game, there are some poachers hanging around in a village nearby. They just hunted down a crow and locked the bird up in a cage. Now they are gone for hunting, and therefore its the apt time for you to rescue the crow. You need to solve some puzzles by using the clues spread around. Best wishes in your rescue task. Good luck and have fun! oh turn clue paper over..
and take scarecrow hat for clue.. Very very laggy... Why can't you do like every other developer? Every time is different with your games function. Usually it does function BAD. Sorry, one star. They've been fine for a while, but this one's very laggy. Can't be bothered.